I like to have a special theme for my drinking each summer–just a little something fun to sample and learn about. Since two years ago was my “Summer of White” and last year was my “Summer of Weiss Beer,” I dedided that 2007 would be my “Summer of Flights.” To kick things off, Fuzzy and I decided to try the Duke of Perth’s Whiskey Flights. Since we’re big fans of the Duke of Perth (and their fish and chips), we’ve been eyeballing them for some time, but we always find ourselves with a car, or a show or some other reason to not drink. So when we found we had last Friday free, we went for it! They offer 4 flights–three of them are $18 each, and one is a whammy of a $70 flight, each with a different theme. Fuzzy opted for the Roving Dover, and I dove into the For Peat’s Sake. As well as three samples each, they provide menus for each flight with descriptions of each’s Nose, Body, Palate, and Finish. From left to right, they were weaker to stronger (not that the weakest was “weak”), and I found that my favorite was the first one, a Talisker 10 year from Skye. Likewise, Fuzzy’s first one was his favorite, a Glenkinchie 10 year from Lowland. I was glad that our food came quickly, cause samples of six whiskeys on an empty stomach could have made for a different evening.All in all, it was delicious, and the awesome atmosphere (the patio is open! ), friendly waitstaff, and delicious food and drinks makes this Highly Recommended in my book!The Duke of Perth is at 2913 N. Clark Street in Lakeview. A flight is a small sampling of something, primarily beverages, though there are food flights as well. Basically, they are ways to taste a number of things without having a full portion of each. So did they have any whiskey, or was it all scotch? To be honest, I’m not sure! I am only starting to develop my palate to the differences in bourbon, scotch, and whiskey. 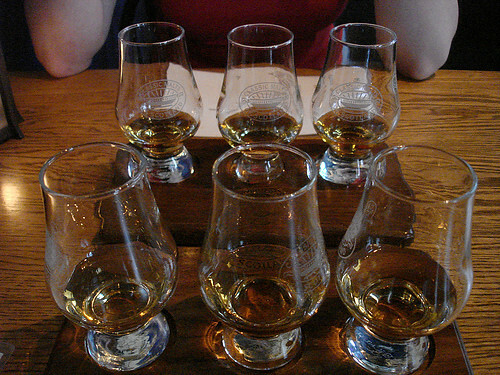 I think all mine were scotch, but some of Fuzzy’s might have been whiskey. On the menu, they called it “Whiskey Flights” so I am assuming there was some in there somewhere. It’s not a matter of palate, really; whiskey is made only Ireland, scotch in Scotland (even if they try and call it whiskey or whisky) and borubon is usually only made in Tennessee or Kentucky. I have no idea what it is that the Japanese are trying to call whiskey. All four drinks are made with different materials and processes. Ah! Awesome–thanks for the info. Then, I think it is all scotch. Single malts. One thing I do know for sure, though, is that it is all delicious!! Check it out, if you can! I should have been clear that I do like the scotch selection at Duke of Perth – it’s a great little place! Delilah’s on Lincoln also has a fine scotch selection.